Fort Bend County Health & Human Services and the City of Sugar land have previously reported mosquito samples positive for West Nile Virus and the county is currently investigating reports of human infection with the virus. DUSK/DAWN are the times of day you should try to stay indoors. This is when infected mosquitoes are most active. DRESS in long sleeves and pants when you are outside. For extra protection, you may want to spray thin clothing with repellent. DEET (N, N-diethyl-m-toluamide) is an ingredient to look for in your insect repellent. Follow label instructions, and always wear repellent when outdoors. Reapply as you would with sunscreen, after sweating and swimming. DRAIN standing water in your backyard and neighborhood – old tires, flowerpots, and clogged rain gutters. These are mosquito-breeding sites. “All residents, regardless of their location, should protect themselves and their families against mosquito bites. Mosquitoes carry many diseases that can cause serious illnesses,” said Dr. desVignes-Kendrick, Local Health Authority and Director of Health & Human Services. West Nile Virus can cause a potentially serious illness that spreads when infected mosquitoes bite humans and other animals. Symptoms include high fever, headaches, neck stiffness, nausea, and vomiting. It is important to note that 80% of people infected with WNV will show no symptoms at all, and only 1 in 150 people infected with WNV will develop severe symptoms. Severe symptoms include fever, and may include unusually intense headaches or confusion. If these symptoms develop, seek medical attention immediately. Symptoms will appear 3-14 days after an infected mosquito has bitten a person. Anyone who experiences these symptoms should contact their provider. Fort Bend County Road and Bridge will continue to monitor mosquito samples for the presence of mosquito-borne diseases and provide control methods when they are found. Please see the attached HHS Epidemiology report for July 2018. Fort Bend County Health & Human Services has confirmed the presence of West Nile virus in a sample of trapped mosquitoes located near Staffordshire Road and 5th Street in Stafford, TX. Late yesterday afternoon, Fort Bend County Road & Bridge was notified of one sample of trapped mosquitoes that tested positive for West Nile virus (WNV). Fort Bend County Road & Bridge began to spray the area for mosquitoes last night. Standard response to prevent mosquito breeding in an area with a positive sample of mosquitoes consists of increased spraying and larviciding in the area until trapped mosquitoes test negative for the virus. West Nile Virus can cause a potentially serious illness that spreads when infected mosquitoes bite humans and other animals. Symptoms include high fever, headaches, neck stiffness, nausea, and vomiting. It is important to note that 80% of people infected with WNV will show no symptoms at all, and only 1 in 150 people infected with WNV will develop severe symptoms. Severe symptoms include fever, and may include unusually intense headaches or confusion. If these symptoms develop, seek medical attention immediately. Symptoms will appear 3-14 days after an infected mosquito has bitten a person. Fort Bend County Health & Human Services will continue to monitor the number of mosquito samples testing positive for mosquito-borne diseases. Please see the attached HHS Epidemiology report for June 2018. IMPORTANT- The SNAP Mobile Clinic has been CANCELLED for Wednesday, July 18, 2018 in Fresno. IMPORTANT: The selection process has changed. Services offered by the SNAP clinic are no longer on a first come, first serve basis. 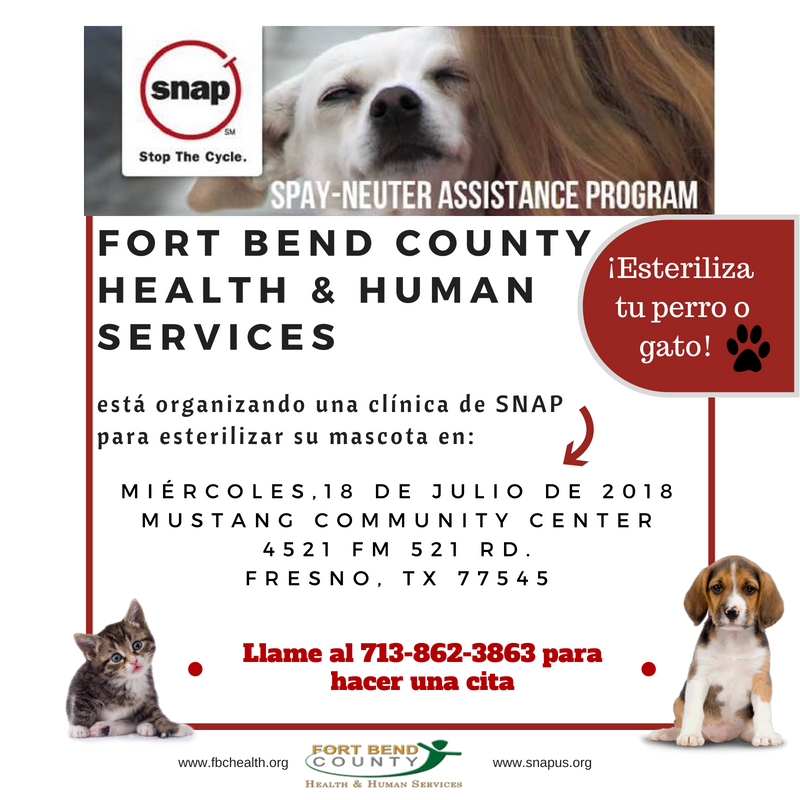 Individuals seeking spaying or neutering services must call 713-862-3863 to schedule an appointment. During your call, you will verify that you are Fort Bend County resident and you will also schedule an appointment for your pet to be spayed or neutered on July 18, 2018. On the day of the appointment, you will need to bring a valid photo I.D. and proof of participation in the following programs: food stamps, free lunch program in schools, Medicaid, Major VA Disability, Section 8 Housing, SSI/SSD, TANF, WIC, or if you are 65 years or older. IMPORTANTE- La Clínica móvil SNAP ha sido CANCELADA para el miércoles 18 de julio de 2018 en Fresno. Usted debe llamar al 713-862-3863 para hacer una cita. IMPORTANTE: El proceso de selección ha cambiado. Las personas que buscan los servicios ofrecidos por la clínica móvil de SNAP ya no son elegidos por sorteo. Personas que buscan servicio gratituo de esterilización tienen que llamar al 713-862-3863 para hacer una cita. Para verificar que usted es un residente del Condado de Fort Bend, llame al 713-862-3863. Durante la llamada, tendrá la oportunidad de hacer una cita para la cirugía de su mascota el 18 de julio. Por favor de llevar una identificación con foto y algún comprobante de su participación en uno de estos programas a su cita: estampillas para alimento, comidas gratis o a precio reducido en las escuelas, Medicaid, Descapacidad de VA, Vivienda de Sección 8, SSI/SSD, TANF, WIC, o prueba de que usted tiene 65 años o más. The Fort Bend County Medical Reserve Corps, in partnership with Fort Bend County Health & Human Services’ Public Health Emergency Preparedness Program (PHEP) and the Homeland Preparedness Project, will be offering a no-cost tire recycling drive on Saturday, June 30, 2018 from 9:00 a.m. to 12:00 p.m. at the 5th Street Community Center (3110 5th St. Stafford, TX 77477) parking lot. “So far, we have recycled more than 1,000 tires for our community members. County residents have taken the advantage of this opportunity to drop-off old, unwanted tires. Tires hold stagnant water which provides the perfect mosquito breeding environment,” said David Olinger, PHEP Coordinator. The tire drive serves as a mitigation project to help reduce breeding grounds for mosquitoes that may carry diseases such as Zika, Chikungunya, and West Nile that can be transmitted to people. “To date, we have not had any reported cases of Zika, West Nile, or Dengue in the county. 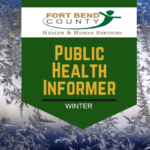 We will continue to educate the public on actions they can take to reduce the number of mosquitoes around their home that may carry diseases,” said Dr. Mary desVignes-Kendrick, Director of Fort Bend County Health & Human Services and Local Health Authority. · The event may finish early if all recycling containers are full before 12:00 p.m. Residents with other items that need to be recycled, such as newspapers, plastic bottles, etc. can contact Fort Bend County Recycling Center at 281-633-7581 or visit their website for more information.